Lynmar is a small family owned winery. Located in heart of Russian River Valley, south of Sebastopol. Lynn Fritz, proprietor, purchased Quail Hill Ranch in 1980 as his retreat. Over the years Lynn added more acreage, buying surrounding land. Today Lynmar Estate stands at 100 acres. Starting in 2001 Lynn became very involved in the growing of grapes. 2005 he launched a state of the art winery. In 2008, Lynn and wife, Anisya made Lynmar Estate their permanent home. 2012 Shane Finley was chosen lead winemaker, formerly of Kosta Browne. Anisya spearheaded gourmet food pairings to the wine tasting experience. Lush organic, estate vegetable gardens, are foraged by executive chef, David Frakes. On the Provisions Menu and lunch menu. Sit under a bright yellow umbrella for the luxury wine tasting experience. The patio has views of vineyards, flower/vegetable garden. Wander through the lush gardens and up the hill for the chickens. A seed barn and chicken coup contrast nicely with the modern tasting room facility below. A giant grove of Redwood trees surrounds the outdoor, large stone pizza oven. These words describe Lynmar: elegant, fresh, modern, sophisticated, welcoming. A wine tasting experience that speaks to your soul. Chardonnay and Pinot Noir are Lynmar’s specialties. Also a Syrah and Rosé. Lynmar portfolio includes 24 labels and styles. 14 clones of Pinot Noir and 4 clones of Chardonnay. Price of Wine $45 and up. Wed-Fri, Max group 4. Seated on patio. Times: 10:00am, 11:30am, 1:30 and 3:00. $30 pp., 4 wines, fee waived with purchase of a case of wine. Three Course Farm to Table Lunch: by appointment Thurs-Sun, Max group 4. $85 pp. Allow 90 min. Offered April-October. 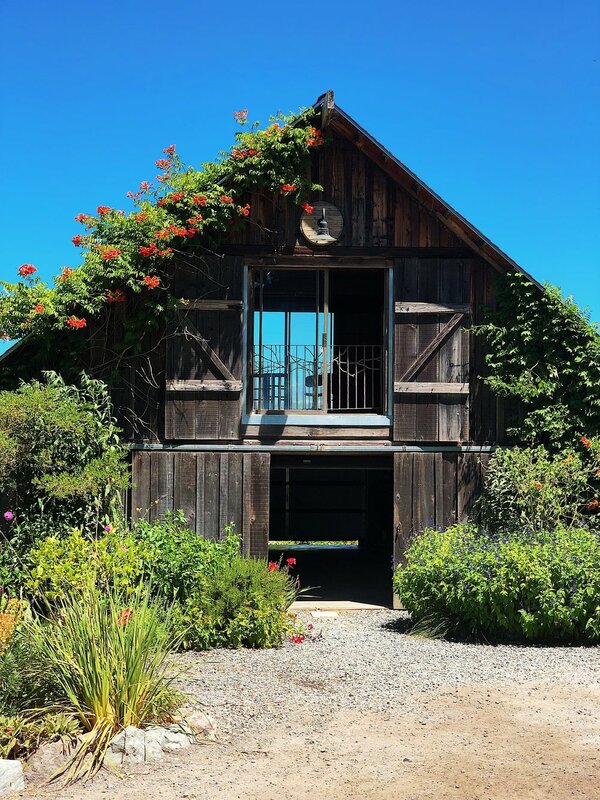 Lynmar Estate sits 12 miles from the ocean, thus the name Lynmar…. Lyn references Lynn Fritz, and Mar, translation is ocean. The estate draws an array of birds. Peacocks preen themselves in front of the glass door of the visitor’s center. Quail scurry about, thus the name Quail Hill. Owl boxes encourage a healthy population of owls to control rodents. And lucky visitors may even see a bald eagle soaring above. The wind often comes up in the afternoon, so you may want to wear a hat and wrap. Please promise you’ll visit here! Sit under an umbrella and overlook the colorful gardens and lush vineyards. Promise you’ll savor every drop of their Pinot. Promise you’ll take your most special people here. This is one of my TOP most favorite magical wineries!